Once you suspend versioning on a bucket, Amazon S3 automatically adds a null version ID to every subsequent object stored thereafter (using PUT, POST, or COPY) in that bucket. 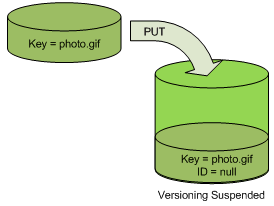 The following figure shows how Amazon S3 adds the version ID of null to an object when it is added to a version-suspended bucket. If a null version is already in the bucket and you add another object with the same key, the added object overwrites the original null version. If there are versioned objects in the bucket, the version you PUT becomes the current version of the object. 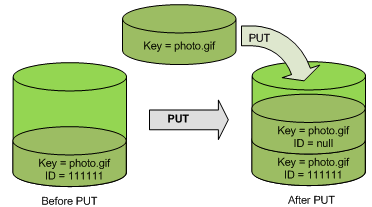 The following figure shows how adding an object to a bucket that contains versioned objects does not overwrite the object already in the bucket. In this case, version 111111 was already in the bucket. Amazon S3 attaches a version ID of null to the object being added and stores it in the bucket. Version 111111 is not overwritten. If a null version already exists in a bucket, the null version is overwritten, as shown in the following figure. 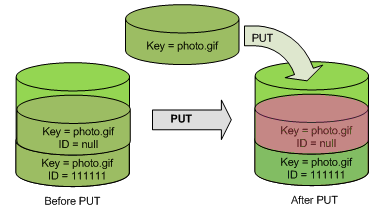 Note that although the key and version ID (null) of null version are the same before and after the PUT, the contents of the null version originally stored in the bucket is replaced by the contents of the object PUT into the bucket.